Komal had always been enchanted with dance and Music. She believes deeply that every form of art has its power, strength, grace and character that influence society by bringing its own unique value and life energy. She continuously strives to seek out knowledge in various forms of healing which is holistic, which keeps us away from drugs and medications as far as possible. This is by using one’s own energy to heal. Growing up with unique fondness and love for dance and music. Komal at a very young age was inspired and motivated by dance and music. She also grew up learning and participating in Bharat Natyam and Classical and Indian folk Ballets. Emphasizing the importance of imparting values through dance. She truly embodies this creative process of using dance as a powerful medium to impart values of Healing to society. Komal was mentored by President Award winner and eminent Kathak exponent Guru Pt. Sandeep Mahavir who not only mentored and guided komal in kathak, but was very instrumental in shaping komal as an individual. By his blessings, and ever insightful guidance, komal blossomed into the talented artist she is today. Komal being a Founder & Director of Kundalini Holistic Healing has created her unique modality “Dance as a medium to heal” knows as “KUNDALINI THE DANCE TEMPLE”. She has for the very first time taken dance to a higher plane, by evolving her own unique method to help people heal themselves through pure awareness and expression using dance and music called Kundalini The Dance Temple which was a successful launch on 24th March 2015 and was highly acknowledge and appreciated by Udit Narayan (Singer), Shaina NC (BJP) and Jaywantiben Mehta (BJP). She is now successfully conducting Dance Therapy Workshop all over Indian and Internationally. She recently conducted her workshop in Khajuraho Dance Festival and was appreciated and honored by Kavita Singh- Chairperson Nagar Panchayat (Wife of Shri Vikram Singh MLA). Kundalini The Dance Temple was also appreciated by Prof Dr Mohsin Wali- Personal Physician to the President of India who personally attended the workshop and highly acknowledged and applauded the modality and her passion and dedication to spread awareness of healing through Dance. She has received many Awards, lately she was been awarded as an Iconic Woman Creating a better society through Dance and Music. Komal Shah recently performed of all (ALL LADIES LEAGUE) and mesmerized the audience with her unique method of Dance & Healing through her Dance Performance and was honoured with an Award as “Women of Substance.” She has studied well over a decade, studying various ancient forms of healing the human body, mind and soul. 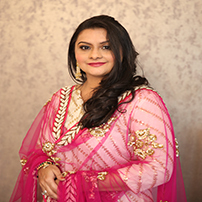 She learnt marvellous methods of healing from the renowned institute Theta Healing Institute of knowledge, Idaho U.S.A. By seeking to eradicate suffering and stress from this world, Komal found her true calling in life. Komal is professional therapist, trained in Past Life Regression, Theta Healing, Clinical Hypnosis and Kundalini Awakening. Apart from this, she has acquired further knowledge in esoterica, spirituality and various forms of healing arts. She has developed into a unique artist with a fully defined repertoire of nurtured and acquired abilities and skills in the field of dance and therapy for those that are seekers of higher level of consciousness and spiritual awakening. Komal is an Indian Classical Dancer, Healer and Therapist. She uses Movement, Mudras, Sound and Affirmations to cleanse ,balance and activate each chakra in her fun yet intense Dance Therapy workshop..! Achieving great success and appreciation in her Unique modality in India ,she for the very first time is imparting her Art in NYC (USA) . ‘Kundalini Holistic Healing’ is now a platform for everyone to experience and actualize oneness of the mind, body and soul, through various healing techniques. Komal’s Healing centre will reach out and help all those seekers, who want to heal one’s own energy, guided by the master therapist healer Komal Shah. What she is doing has been practiced for centuries across the world. Her treatments are customised for each individual based on each body condition. Healing is a systematic process where positive belief is the first step and she guides you through the process of chakra healing. The complete experience is Relaxing, Refreshing, Rejuvenating and Healing.